Have your Abs and Eat Pizza too! When we’re talking about health, fitness, fat burning and body transformation, “moderation” and your definition of it becomes very important. It is moderation that is going to allow you to live a life in a “lean” state without feeling like you are constantly always dieting. Moderation allows for the occasional pizza night, or birthday cake. It allows you to not have to hide from your friends when they want to go out for dinner. Moderation creates mental balance that keeps your mind healthy and makes keeping body fat off an easier proposition. But, it is how you define moderation that makes the difference. And your definition of moderation needs to be based on your goals. The way the 80/20 rule applies to your diet is that you are simply eating “good” fat burning foods 80% of the time. The other 20% of the time you are free to eat anything you want. 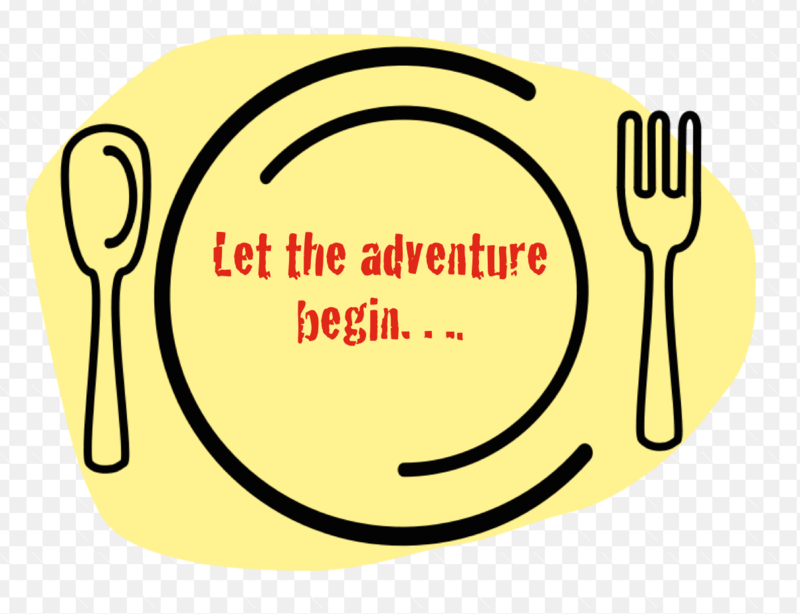 In practice and simplest terms, if you are eating 3 meals each day that works out to 21 meals a week. In any given week, 17 of those meals (80%) are designed to get you closer to your goals and the other 4 meals (20%) can be anything you like. In my experience as a nutrition coach and fat loss expert I’ve found the 80/20 rule can work, if used responsibly. By this I mean that it is really easy to “undo” a lot of good work even with only 4 meals a week. Eating “anything you like” cannot turn into eating “as much of anything you like”. This is where moderation becomes so important. You must be able to indulge in those 4 meals a week without going way overboard on calories. But the 80/20 rule done properly, is far more effective as a maintenance plan than an active fat burning diet. When you are actively pursuing a goal of fat loss, I have found that 80/20 does not provide most people with a fast enough fat loss to keep them motivated. In my experience, one of the most important elements of a successful fat loss plan is the ability to rapidly lose body fat. Rapid fat loss fuels motivation and keeps you excited to carry on with the diet even when cravings creep in. 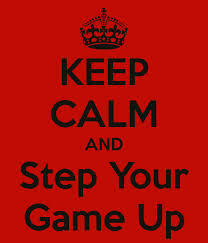 In this case, as Snoop Dogg would say, you need to Step Ya Game Up! When fat loss is your goal, shoot for a diet that is at minimum 90% geared towards fat loss and in some cases 100%. This means, using our 3 meal a day example, you are only indulging a maximum of 2 meals a week and if you want really fast fat loss you may find short periods without any indulgence is ideal. You can very easily find what works for you by tracking your results. If things are going well at 90%, and you’re happy with the progress than stick with that plan. If you’re not happy with the progress than move closer to 100% compliance. When is a Large Pizza a Good Thing? I do have to say, I’m pretty good at “cheat” meals. There’s a lot of food out there that I really can’t get enough of and won’t ever be able to completely remove from my life, pizza being at the top of that list. There are instances when these “cheat” meals can actually speed up your progress and it all hinges on one very special hormone. This hormone is Leptin. Leptin is a hormone secreted from body fat cells. The more fat you have the more leptin is released. When you eat an excess of calories, leptin’s signals the body that it is fueled up. Once this happens your brain then sends the signal to decrease appetite and speed up your metabolism. On the other side, when you are not eating enough calories, as is often the case with prolonged fat loss diets, the opposite happens. Your fat cells shrink causing less leptin release. Your brain senses the low leptin levels and the message is sent out to lower your metabolic rate and increase appetite. Bottom line, to burn body fat you want to be able to control and manipulate leptin levels so that your metabolism doesn’t decrease. 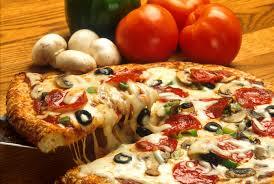 Eating low calories and low carbs for long periods of time depresses your leptin levels slowing down fat burning. Basically the more fat you lose the harder it becomes to keep losing, unless you keep your leptin levels under control. Now, here’s where the large pizza comes in. It turns out that Leptin is best increased by eating meals high in calories and high in carbohydrates. By strategically eating high calorie and high carbohydrate “cheat” meals you can keep you Leptin levels elevated thus keeping your body burning fat. This technique of strategically indulging in your favorite foods is the most effective way of coaxing your body to rid itself of even the most stubborn deposits of body fat. The moral of the story is have a strategy for moderation. Define your goals and then shape your definition of moderation around those goals. Moderation will change as your body changes. When fat loss is your goal you want to combine high compliance of “good” food (90%-100%) with an occasional high carbohydrate “cheat” meal to keep your Leptin elevated and keep fat burning rolling. Go after your lean body goals with purpose and you will create a body transformation of epic proportions. In the words of International Man of Mystery Austin Powers, “Allow myself to introduce……..myself.” I am a fat loss expert and certified Precision Nutrition Coach. I have spent more than 13 years coaching clients towards “real world” results. In that time I have also became certified as a Specialist in Performance Nutrition and a Certified Fitness Trainer. My experience and passion went into creating the ultimate fat loss diet program. 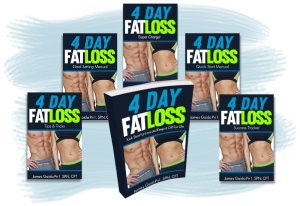 4 Day Fat Loss (4DFL) is dedicated to teaching simple techniques to rapidly burn fat, increase energy and live a healthier life. If you want to find out how to burn fat quickly and transform your body check out the 4DFL Method. Another Epic Fail – I Blame the Fish! Dinner is often an adventure at my house. But this time, I BLAME the FISH! Though freshly purchased that day at the fish counter, it was really ‘fishy’ tasting. Hannah was still willing to eat it, but only if I took a shot for every fishy bite (the kids know I’m not a big drinker and this would have been entertaining). I declined her challenge and offered her left over chicken instead. Although washing down the fishy fish with a shooter may have been a good option. We had a lot of laughs at my expense, it was good fun, but as a mom, I know that this serving fishy fish is a kin to serving Fruit Loops for dinner: good fun but not a healthy choice. While fishy fish ‘may’ be healthier than Fruit Loops, I’m actually not sure, so to be safe, I probably shouldn’t make that a habit. 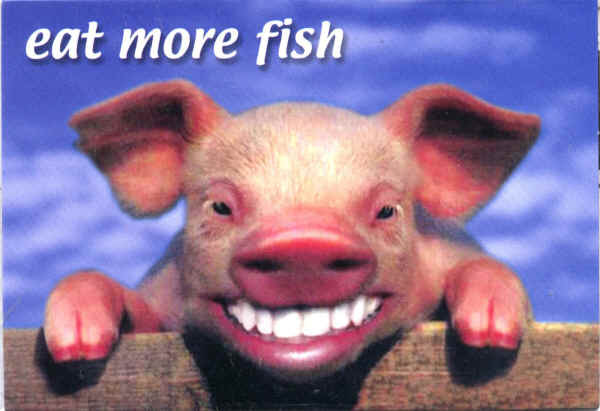 But again, I blame the fish! Clearly, I’m no Betty Crocker. That’s where Flavia comes in. She’s my friend and sent me her Flavalious cookbook to test drive. Sam doesn’t need to know the name of the cook book, but he can attest to the fact that there have been less epic fails – thanks to Flavia. Then again, if you’re a seasoned vet in the kitchen, you’ll also appreciate the recipes that create impressively healthy meals with little effort. PS. 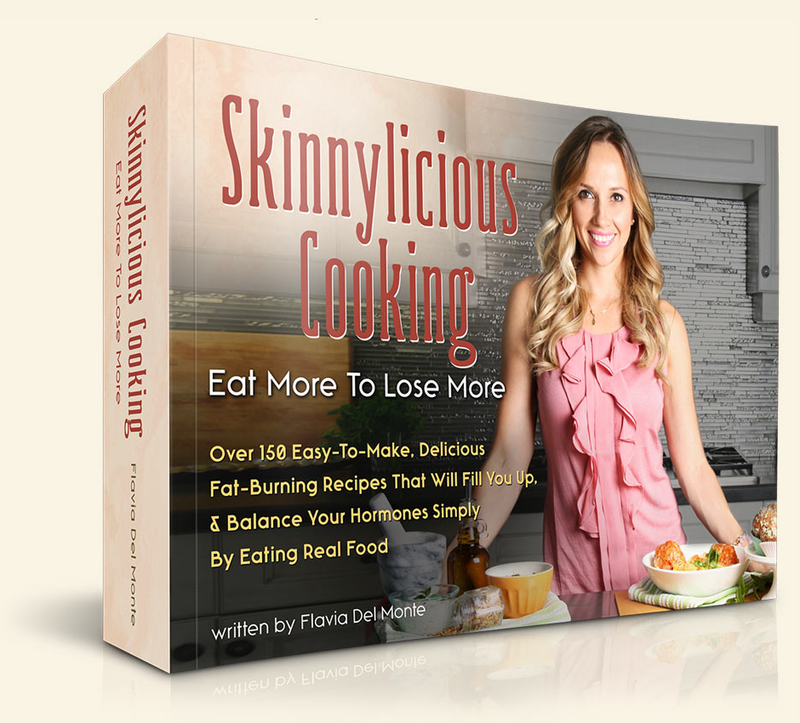 Flavia has offered a limited number of hard copies for purchase – FOR A FRACTION OF THE COST. In most cases, I find the majority of active people (especially women) don’t get enough high quality protein. Keep in mind, if you’re exercising intensely on a regular basis your protein demands will be higher than somebody who’s sedentary. Most studies and research done on protein absorption seem to show that sedentary people really don’t need much more than 20 grams per serving…intense exercisers can possibly absorb more than this. As a rule of thumb, I try to keep my serving size from 20-30 grams each meal. 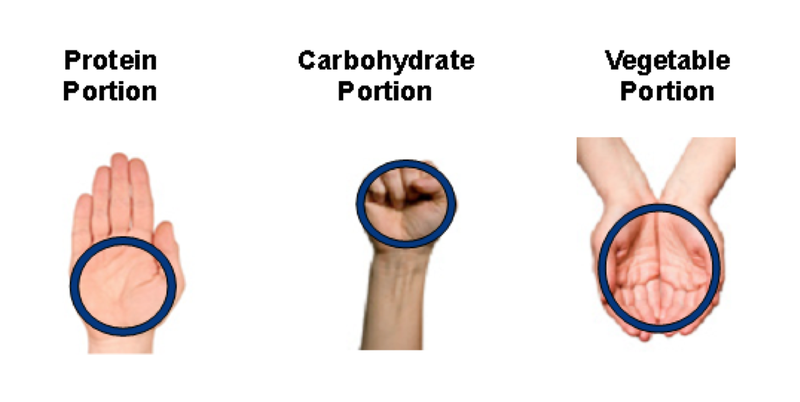 This guide below is magically personalized – if you’re a big dude or a small person, your hand size and portions will reflect that. So if the thought of calculating your lean body mass (lean body mass = bodyweight minus body fat) leaves you befuddled (and I can’t say that maths has ever excited me in my ENTIRE life), this is an easy ‘at a glance’ way to work it out. It’s a portion guide you’ll have everywhere you go. Now here’s the REAL MAGIC about eating more protein: it moderates your blood sugar and appetite so that you have sustained energy and you won’t be starving all the time. This is why you need to include a serving of protein with every meal. Chicken, lamb, beef, fish, Greek yogurt, turkey, beans, eggs, nuts and seeds are all great sources of protein. Challenge yourself to include more lean proteins in your meals from now on. Check out these healthy and delicious recipes that will help you meet your protein requirements without having to eat dry chicken or other tasteless food every meal. C’mon now, be honest…how many of those mini chocolate bars did you sneak? Or what guilty pleasure fell down your throat? Actually, that was last year. This year, I spent Halloween on a plane to Florida. I flew to a quick weekend meeting with my fitness pals (like Mikey Whitfield and Kate Vidulich) and this saved me the sugar rush and crash. I’ll be the first to admit that I fall down too. Every now and then it’s good for me to feel the crash of sugar and the resulting hangover as confirmation as to WHY I eat clean 90% of the time. Who wants to feel crappy like that? Thank you sugar for making me feel like a warm turd bag, breaking up with you is made so much easier this way. This is my perspective NOW, NOT as a newly ‘sugar single‘. When sugar and I were hot and heavy, breaking up was MUCH harder. Many of my VIP coaching clients are expressing frustration of headaches, low energy, loss of the will to live (okay, so not that dramatic! )…but you get the picture. Sugar’s addictive nature can be as powerful as a drug. In fact, as you’ll learn in the video below, sugar works on part of the brain in the same way that cocaine does. 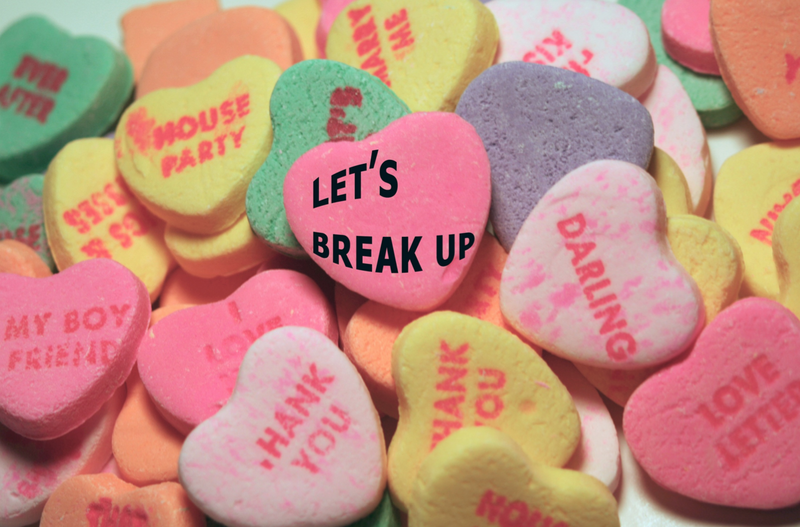 Breaking up with sugar is HARD TO DO. Those nasty side effects of NO sugar are fleeting, only a few days. And living a (basically) sugar free lifestyle makes for much more energetic living and better body composition. If you and sugar are ‘going steady’, it’s time to reconsider…sugar isn’t the sweet companion you thought it to be. The ravages of sugar are more serious than just having the potential to add a little flub. I couldn’t help but post this entertaining but sobering video from John Oliver about sugar. 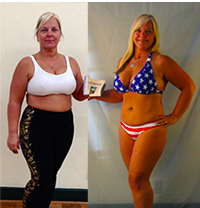 As well, read about Pam below and see how she BEAT sugar and her weight issues with THIS. Pam realized that sugar was a problem for her. At 5’1″ and 191 pounds, she was obese and it was clear that shedding pounds would make her healthier, more energetic, and so much happier. Pam had tried everything… including perhaps one of the most dangerous weight loss methods EVER… gastric bypass surgery. With this kind of surgery, you’ll become weak, tired and more than likely, you’ll gain most (if not all) of your weight back. It’s much like a fad diet. It’s a vicious roller coaster that can rob you of your energy, your money and your hope for a healthy future. Here’s where the story gets really tough. After surgery and hitting her desired low of 130 pounds, her weight began to slowly but surely creep back up. Then it got worse: 10 pounds became 20, then 40 lbs. Finally she started this simple approach at 191 pounds. She had astonishingly steady success: losing 13 pounds and stripping off even more inches in the first 12 weeks. Pam was just getting started. She crushed her cravings, and as a result, she just placed 2nd in the over 40 category of the 20th TT Transformation Contest. She’s lost 32 pounds and 36 inches off of her body. At age 51, she doesn’t look over 35 (another benefit of this simple approach), and that isn’t even the most amazing part of Pam’s triumph. Finally everything changed: for good. When you look at Pam’s pictures now, you’ll see proof that she’s turned around what could have been a true health disaster. She’s glowing with health and optimism, and she loves eating without obsessing about when and what to eat. You can have the same success as Pam and overcome your cravings and so much more. You can do this in 3 days by getting started here. Meeting your fat loss goals is so much easier when you feel in control of cravings, have direction and stop obsessing over food. Get on top of your goals: look at this. ->How many licks does it take to get to the center of a Tootsie Pop? On average, a licking machine designed by engineering students at Purdue needed 364. ->A whopping 90 million pounds of chocolate candy is sold during Halloween week. ->Milky Way bars weren’t named after their home galaxy. The name comes from a type of malted milkshake that was popular in the early 1920s. 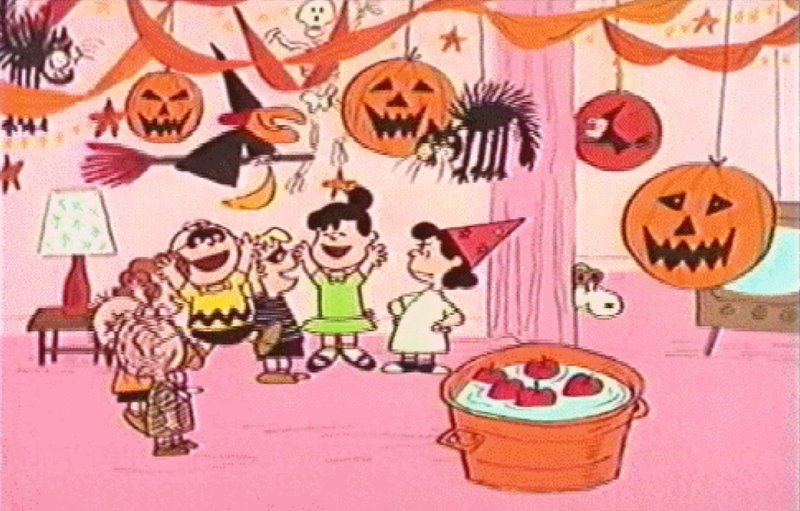 ->After Candy Corn, the leading best sellers at Halloween are as follows: Snickers, Reese’s, Kit Kat and M&M’S. ->Why is bubble gum pink? When it was invented, pink was the only food dye on hand. ->During World War II, Tootsie Rolls were added to soldiers’ rations because of their durability in all weather conditions. 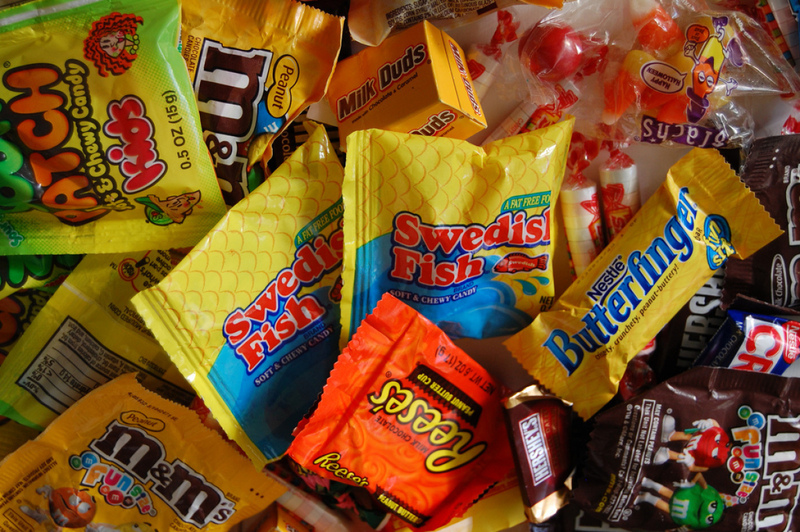 ->A single trick – or – treater’s candy haul equals about 11,000 calories (about a week’s worth). ->Artificial dyes used in M&M’s and other candy have been linked to ADHD in kids. ->Kit Kats, Milky Way, Nerds, Whoppers, Skittles, Butterfinger, and Twizzlers all contain more than 15 ingredients. ->The 19 ingredients in a Butterfinger bar include TBHQ — a preservative chemically related to butane, also known as lighter fluid. Candy gets a pretty bad rap these days. There’s not really room for much of it in a healthy diet. 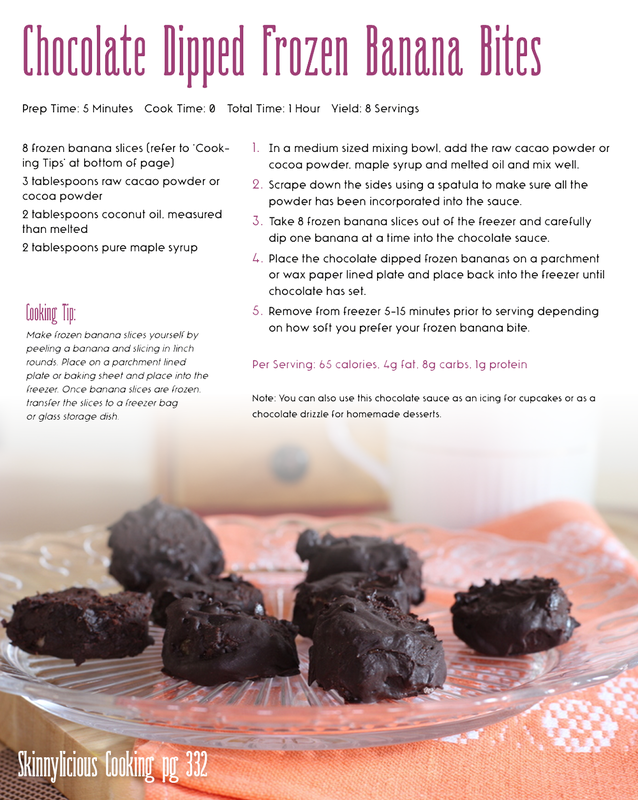 (Scroll down for a recipe for a healthy treat you could have any day though). So what do you do on Halloween? 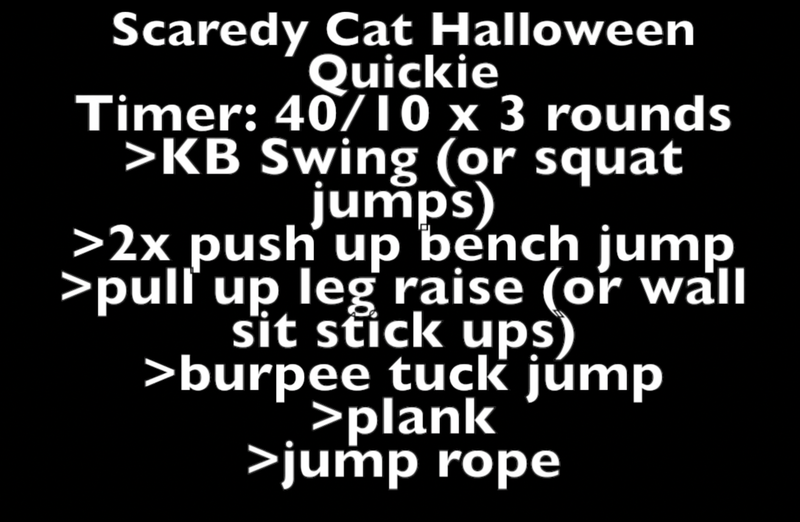 You could do this workout below and then enjoy a treat from a recipe from my friend, Flavia Delmont’s Skinnylious Cookbook. Do 3 – 5 rounds. You’ll get good and sweaty with this one while you work your entire body. Remember that you can have a treat and not sabotage your health in the process. 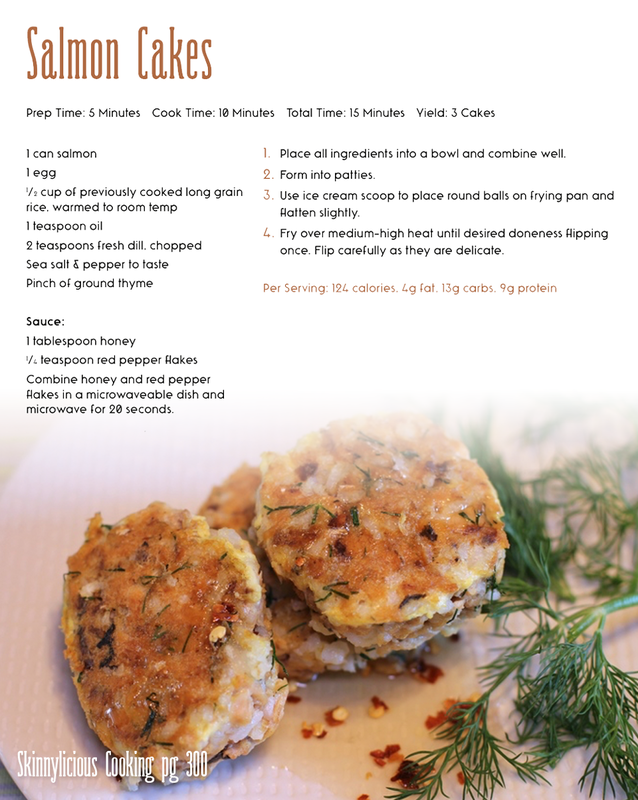 Give Flavia’s recipe a try and find more of those in her beautifully illustrated cookbook with over 150 healthy and easy to follow recipes here.